This wild crafted oil from Madagascar is spicy, sweet and warm. The middle notes are peppery and sweet. Each of TOS's Clove Bud Oils are excellent; however many Flavor and Fragrance professionals regard Madagascar's clove as the best variety. 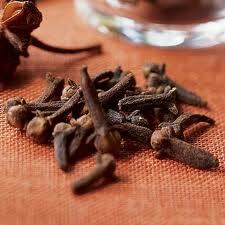 Clove is the highest-scoring single ingredient ever tested for its antioxidant capacity on the ORAC scale. Clove Bud with a high Oxygen Radical Absorbance Capacity ORAC, exceeds 10 million. Many professionals hail it as a major cancer fighter. It is also good for dental problems and in fighting contagious diseases. Rubbed in the area of the prostate has reduced PSA for many. The chemical constituent Eugenol kills tuberculosis bacillus. Dental Care: The most prominent use of clove oil is in dental care. The germicidal properties of the oil make it very effective for relieving dental pain, tooth ache, sore gums and mouth ulcers. Clove oil contains the compound eugenol, which has been used in dentistry since numerous years. Gargles with diluted clove oil help in easing the throat. The characteristic smell of clove oil helps removing bad breath. As a result, clove oil is added to numerous dental products and medications, including, mouth washes, and tooth pastes. Dentists also mix clove oil with zinc oxide and prepare a white filling material as a temporary alternative to root canal. Infections: Due to its antiseptic properties, clove oil is useful for wound, cuts, scabies, athlete’s foot, fungal infections, bruises, prickly heat, scabies, etc. It can also be used insect bites and stings. Clove oil is very strong in nature and hence should be used in diluted form. Further, it should not be used on sensitive skin. Sty: Clove and clove oil is a very effective home remedy for treating sty. Sty is an inflammation on the eyelash and is a very irritating condition. Sty is not only painful, but also causes difficulty in the proper functioning of the eye. Note: Never put essential oil directly in the eye. Apply only to the surrounding area. * Cosmetics: Clove oil is often added in cosmetic creams and lotions. It is a good massage oil providing relief from pain and stress. * Clove Cigarettes: Usage of clove in making cigarettes is a new trend all over the world. Traditionally, clove was added in cigarettes in Indonesia. Smokers (wrongly) feel that the numerous health benefits of clove would nullify the ill effects of smoking. Flavoring Agent: Along with its digestive properties, clove oil is added in food items due to its flavor. It is added in many Indian dishes, pickles, sauce, spice cakes, etc. * Soaps: Due to the characteristic aroma, soothing effect and antiseptic properties, clove oil is added in making soaps. * Perfumes: Clove oil is also used in making perfumes.